gstours and 1 Guest are viewing this topic. 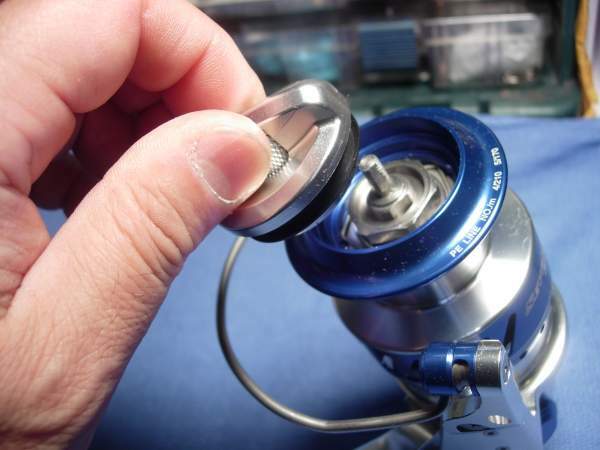 i have generally tried to avoid working on spinning reels. it is a tactic that has become less successful every year. 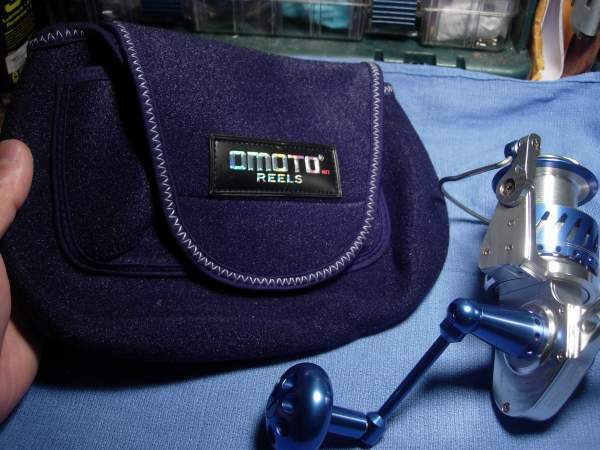 this particular reel was send in by alan chui with omoto in florida. 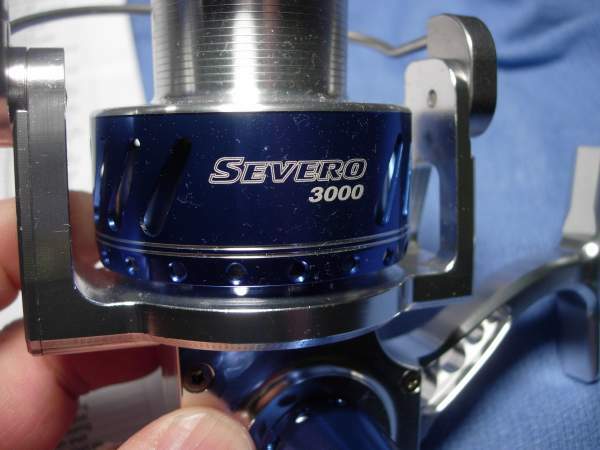 those of you with daiwa saltiga or accurate reels will note some striking similarities. this will be another 100+ photo essay, so grab a cup of coffee and a donut, settle back in your chair and let's get started. 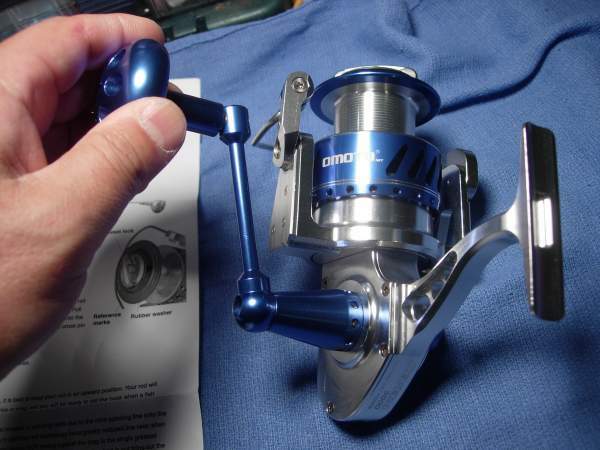 stainless steel gears and 15 bearings mean this reel will be more expensive than most. how much, i do not know, but these features are not cheap. 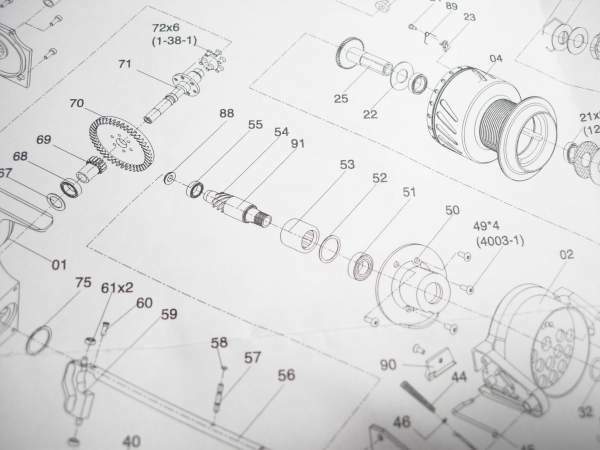 the schematics are easy to read. 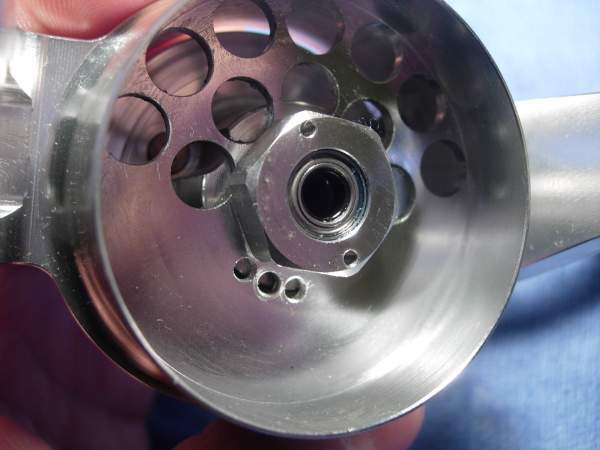 like i said, there are 15 bearings in this reel and nearly all of them will require service. remove the entire handle assembly by simply cranking it backwards. if you've never played with one of these before, there is a drag knob preset (key #5) and a small knurled drag knob preset lock (key #6). 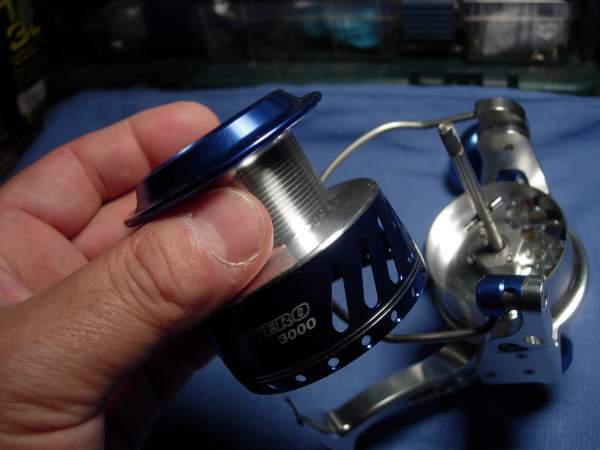 you use the knob to adjust the drag and you use the lock to tighten down or remove the spool. 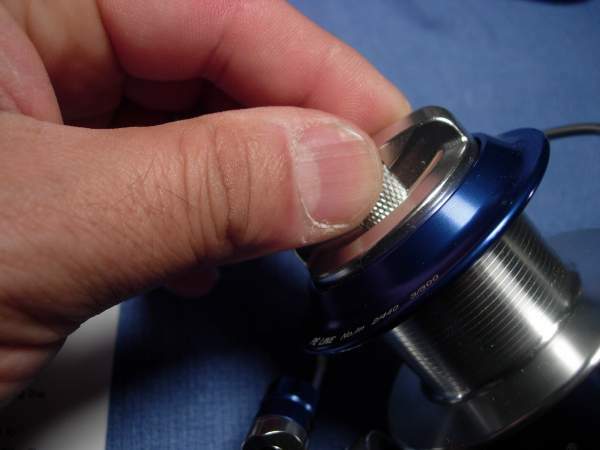 do not use the larger knob to remove the spool. 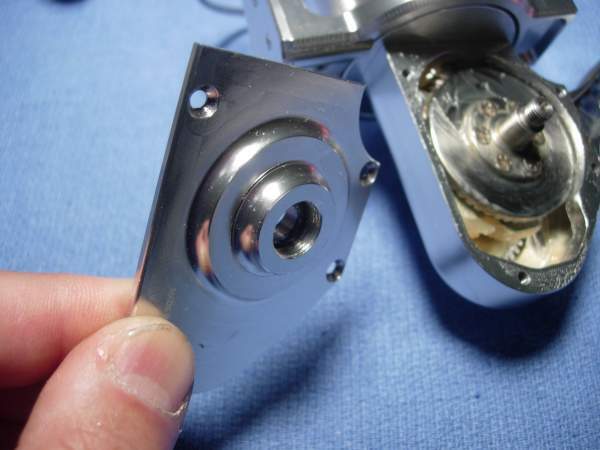 remove the spool assembly (key #4) as a unit. 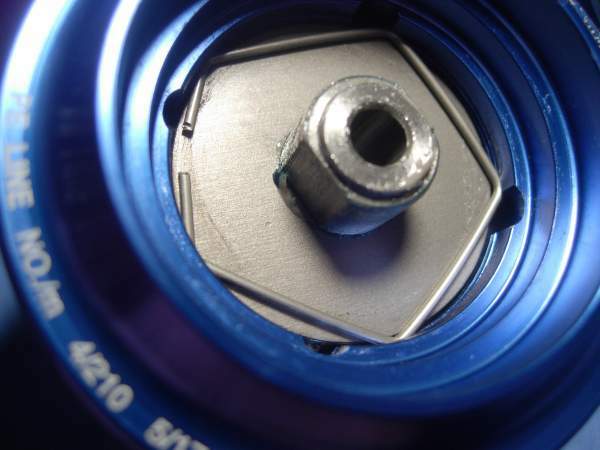 unscrew and remove the drag nut (key #17). 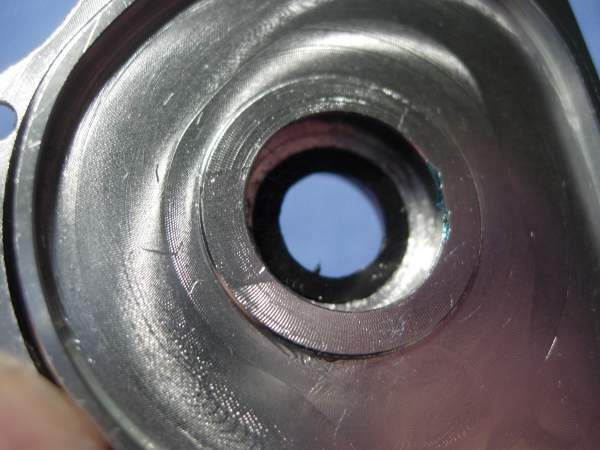 remove the drag spring washers (key #16) and note the "()" orientation of these belleville spring washers. well, i see one problem right away. 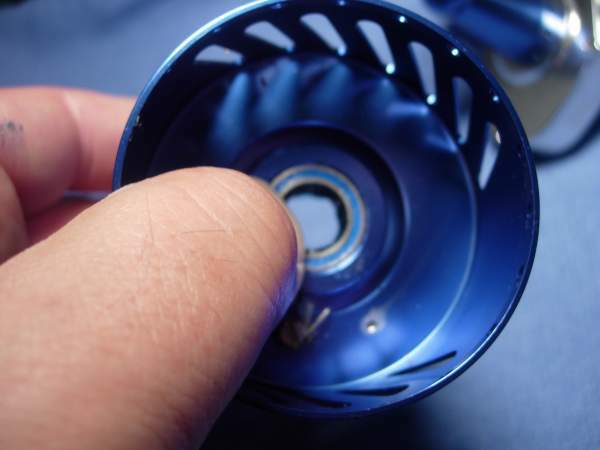 there are only 4 carbon fiber drag washers (key #19) inside the spool. we are missing one. plus, they're dry. 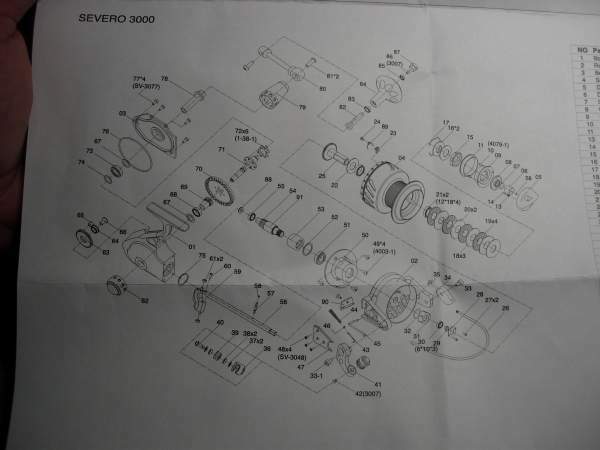 the schematics even specify four drag washers. 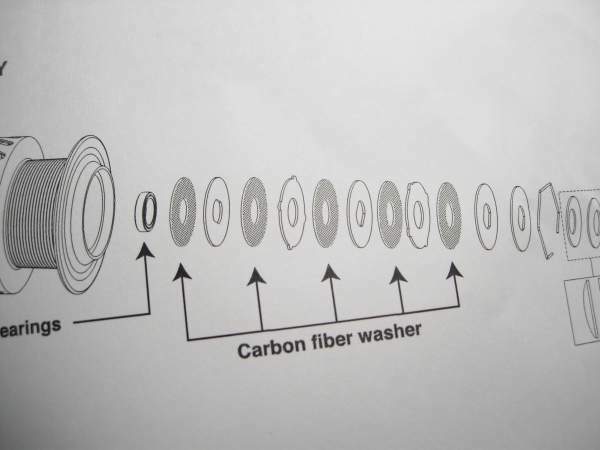 these carbon fiber washers measure 12x31x1 mm. 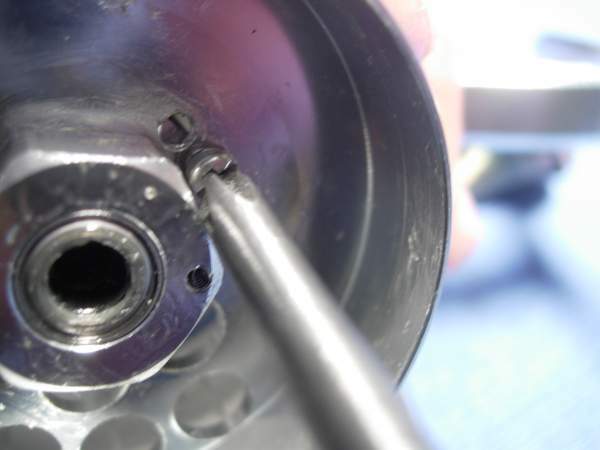 push the drag shaft (key #25) through the spool and we can service the spool bearings (key #21). 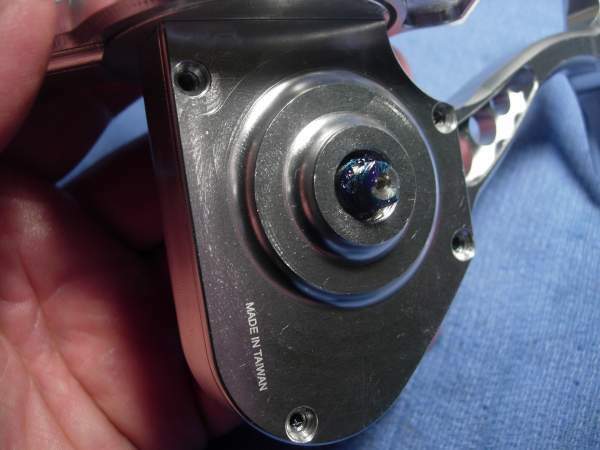 we are going to take our handy dandy bearing packer http://alantani.com/index.php?topic=870.0 and pack these bearings with yamaha marine grease. 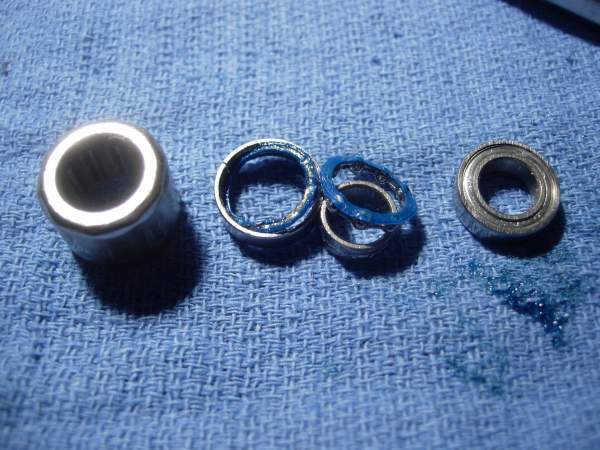 once the bearings are completely packed with grease, the seals can be pressed in and the bearings can be re-installed. 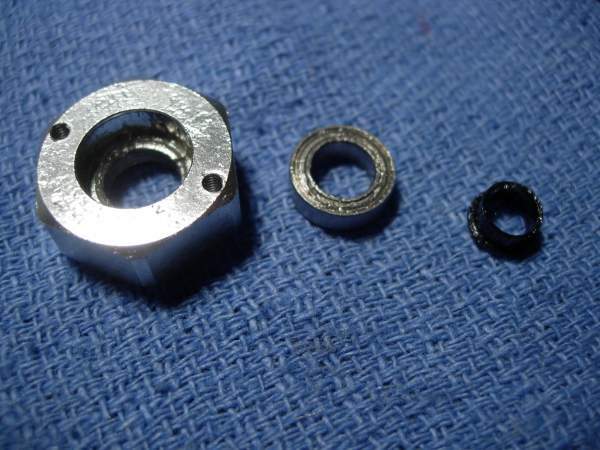 a teflon washer (key #22) measures 12.4x25.3x0.8mm and stuck with the drag shaft (key #25). let's lay everything out in order. 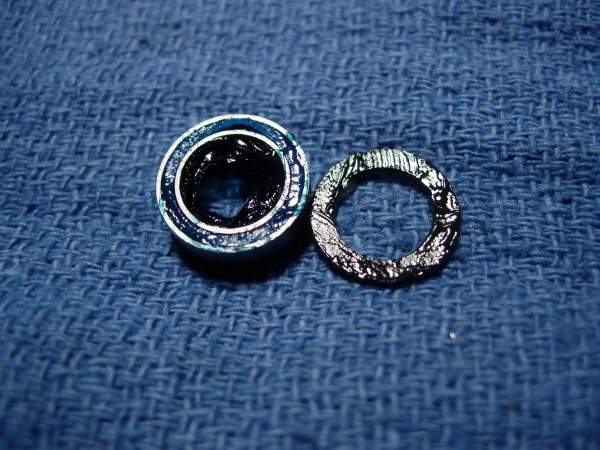 on the top left is the teflon washer (key #22) which we will discard. 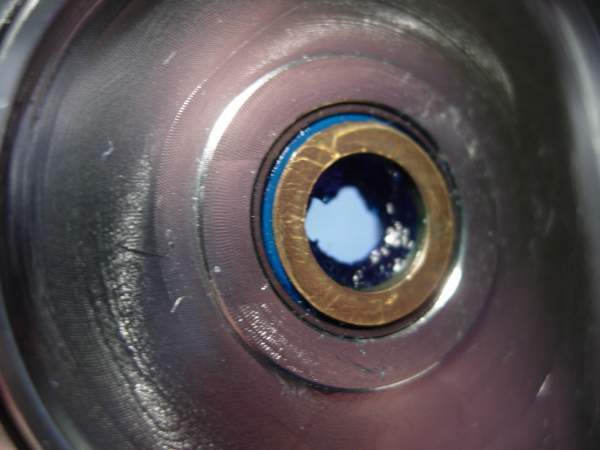 top center is a penn ht-100 drag (part #6-855) that measures 12x21.5x1.2mm. top right is our drag shaft (key #25). in the center row is three keyed metal drag washers (key #18) and two eared washers (key #19). 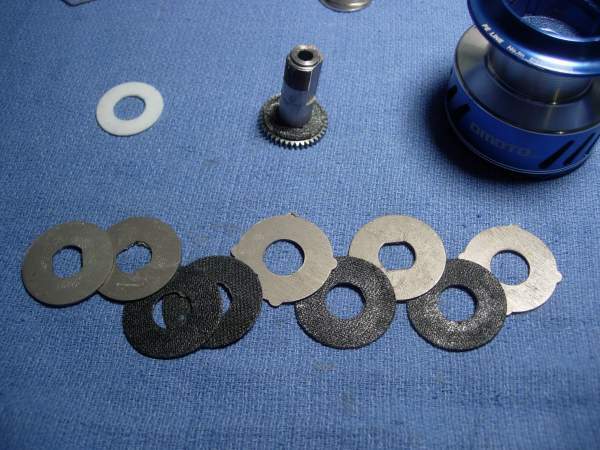 on the bottom row are our four original carbon fiber drag washers (key #19). 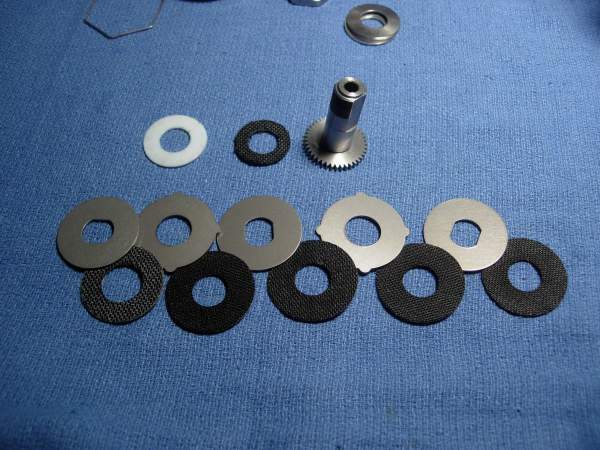 on the bottom left is an additional penn ht-100 drag washer (part #6-155) that measures 14.8x29.5x1.2mm. well, grease them up and throw them all together and guess what? they don't fit!!!! ok, fine! let's go back to the original number of washers and just rearrange them. in this configuration, the drag stack will behave like a "1+3" jigmaster stack of drag washers. too bad, because a "1+5" stack would give you a higher drag range. that's ok, though. we will still get plenty of drag out of this stack. and at least now it fits! ...... and the schematic side of the pamphlet. 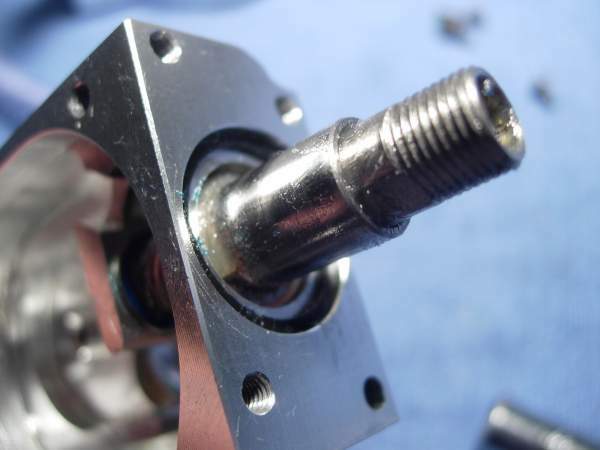 install the drag shaft (key #25) and washer (penn part #5-855) as a unit. 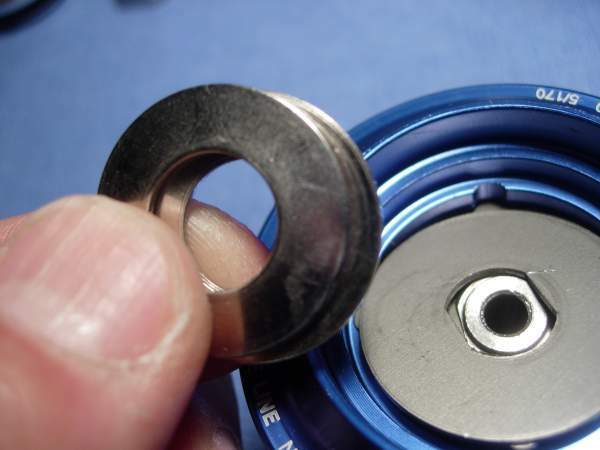 install the drag spring washers (key #16). 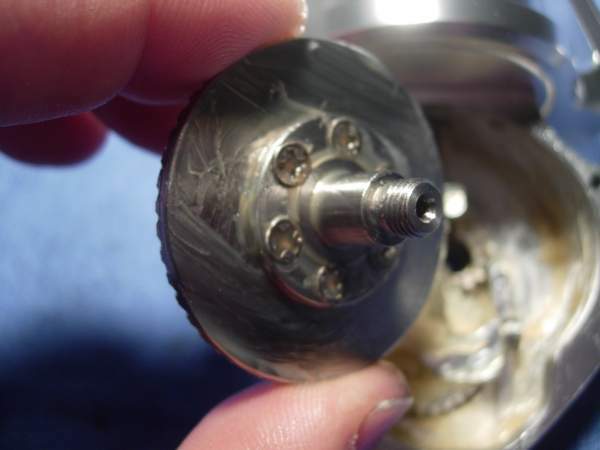 install the drag nut (key #15). 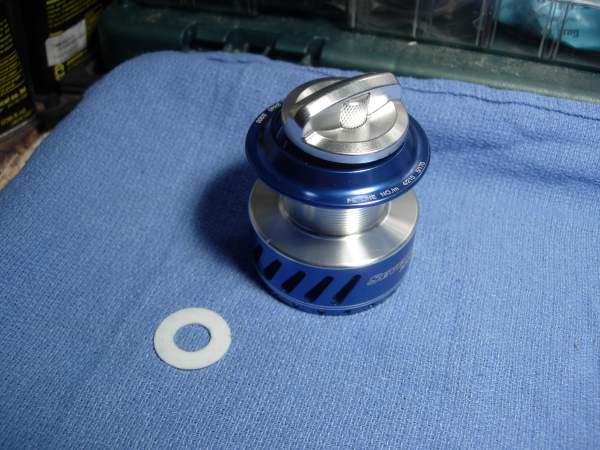 set the spool assembly and the drag knob assembly aside. 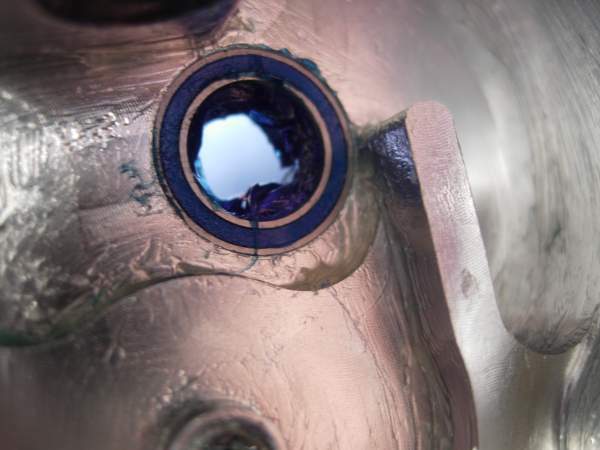 to work on the body of the reel, we will need a number 8 torx bit. 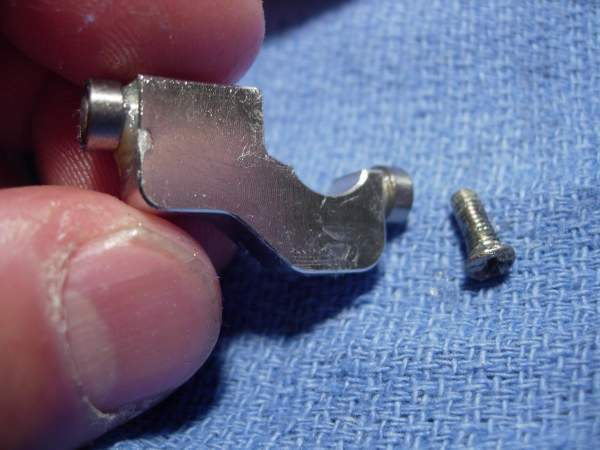 remove the four body cover screws (key #77). remove the body cover (key #3). 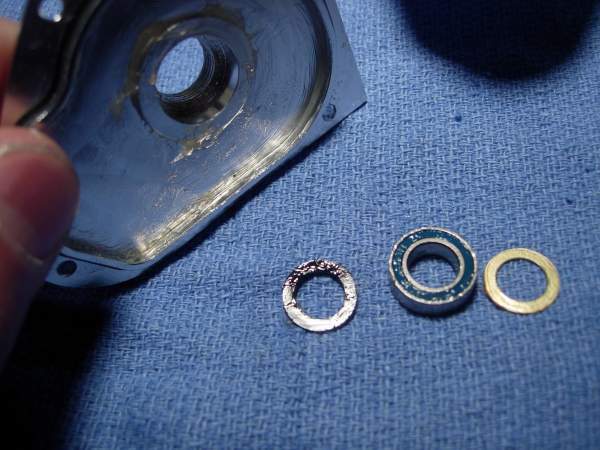 note that the o-ring (key #76), the water proof washer (key #67, not seen here), the left drive gear bearing (key #73) and the left bearing washer (key #74) come out as a unit with the body cover (key #3). 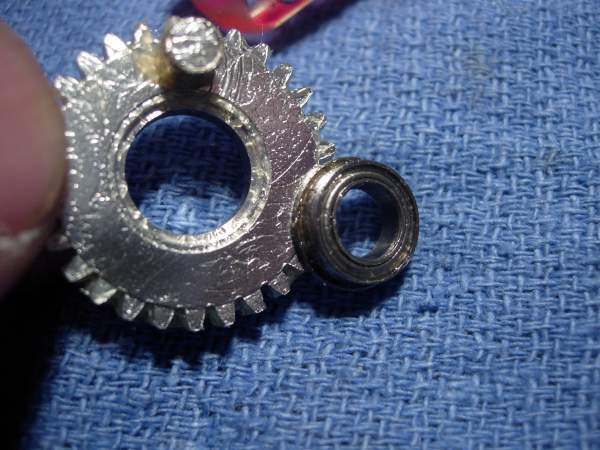 the left drive gear bearing measures 8x14x4mm. 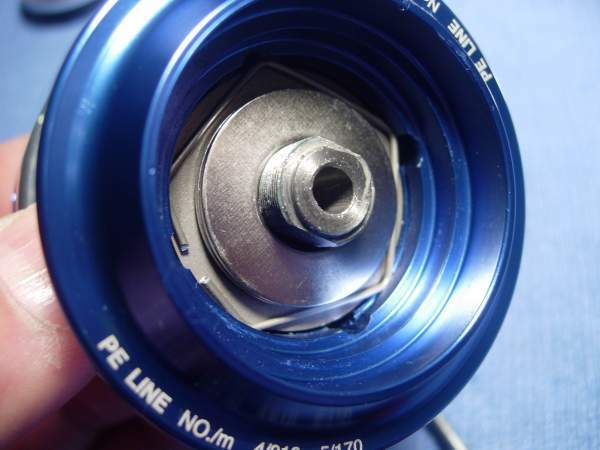 this bearing has air pockets and will be fully packed with grease. 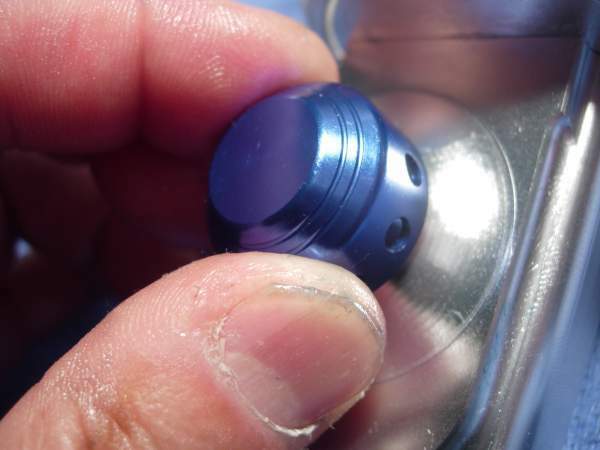 install the waterproof washer (key #67). 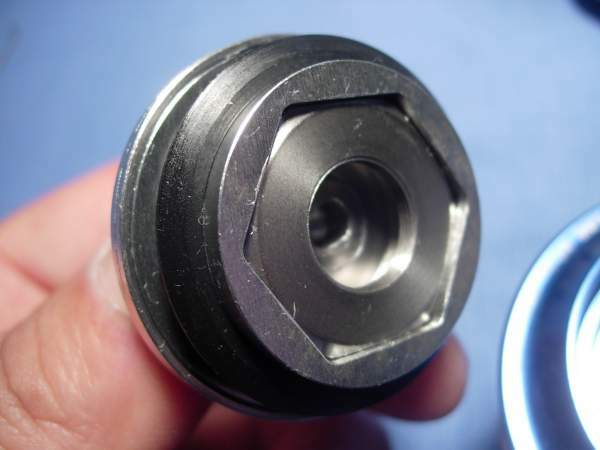 install our fully packed bearing (key #73). 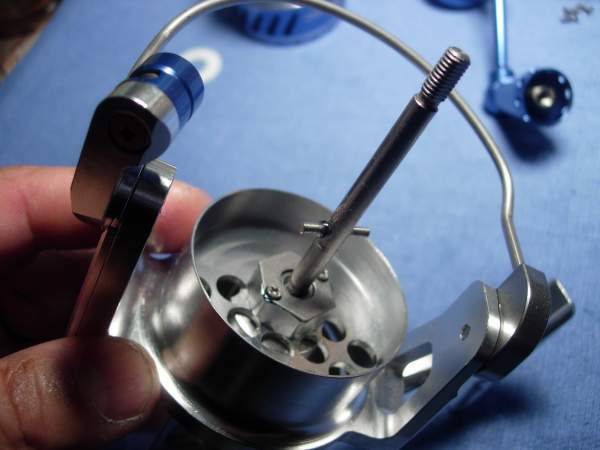 install the thrust washer (key #74) and set the left body cover aside. 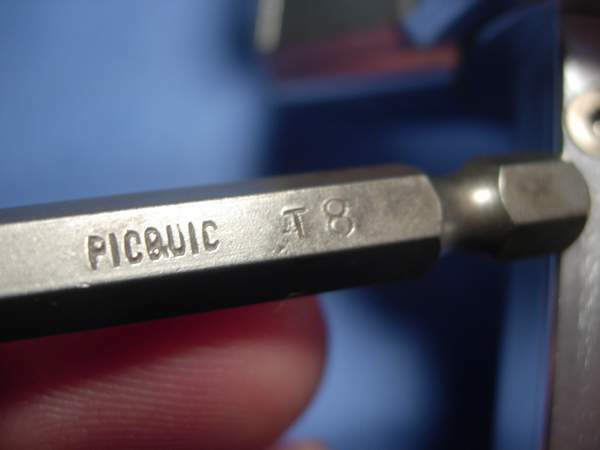 remove the side cover (key #62). 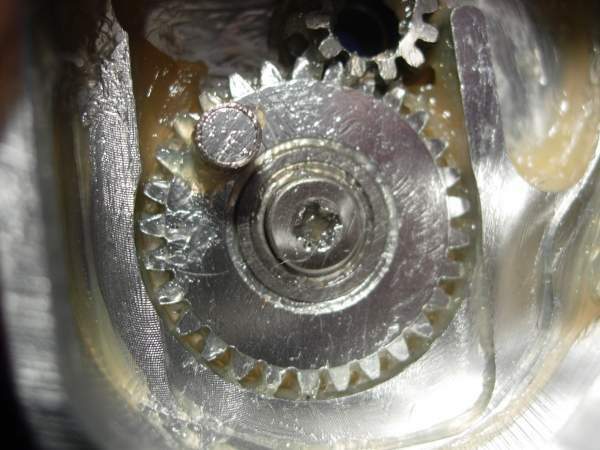 remove the drive gear (key #70) and the drive gear axis (key #71) as a unit. 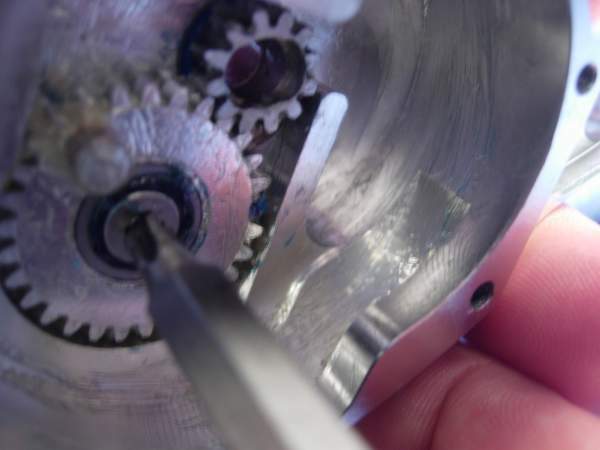 the pinion gear (key #69) is left in place. 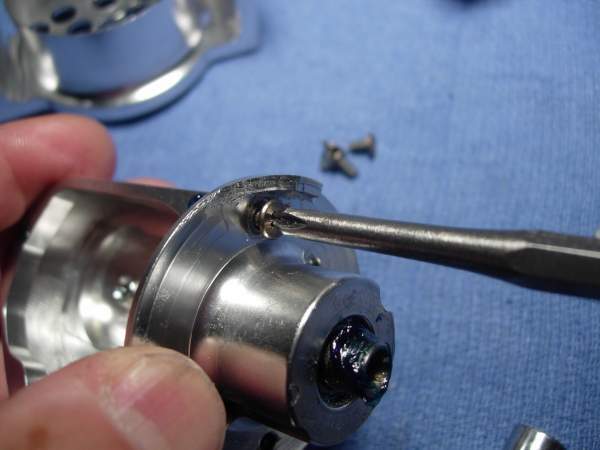 in most reels, the screw (key #60) holding the main shaft (key #56) to the oscilating slider (key #59) is easily removed using a straight screw driver. 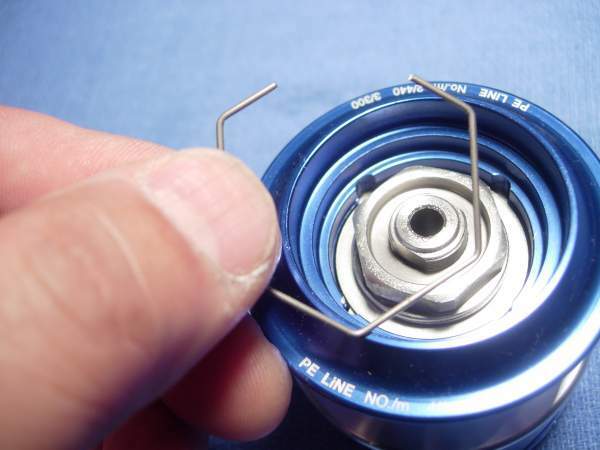 with this reel you need an angled screwdriver. 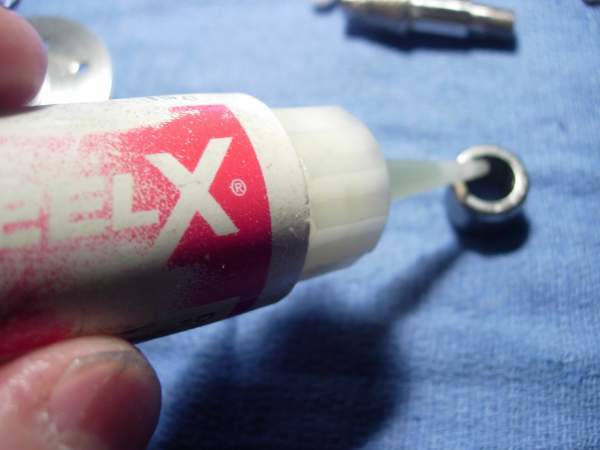 to make matters worse, they used an extra long screw with loctite. 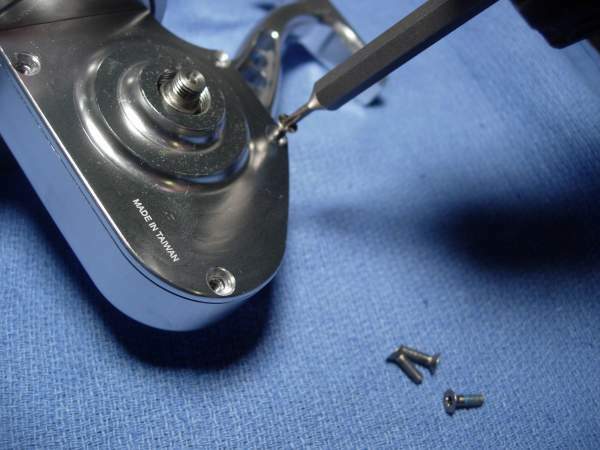 it was not easy getting this screw out. 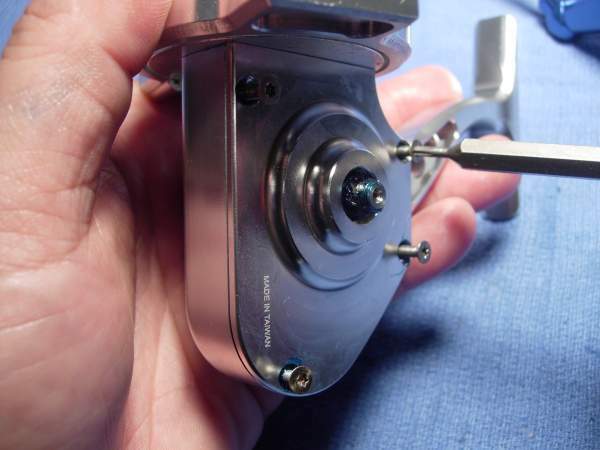 the two small bearings (key #61) on the oscillating slider (key #59) measure 3x6x2.5mm. 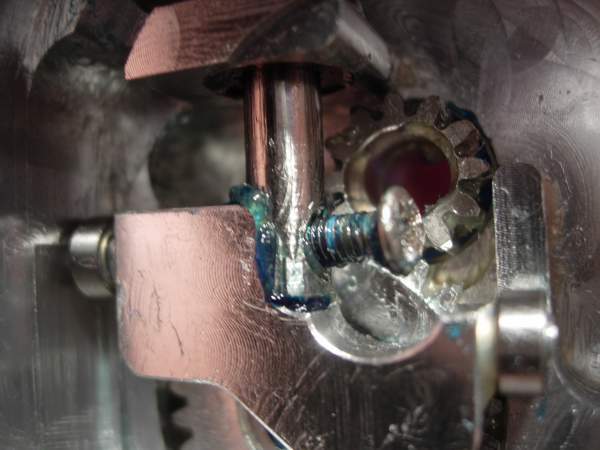 remove the screw (key #66) holding the oscilating gear (key #63). 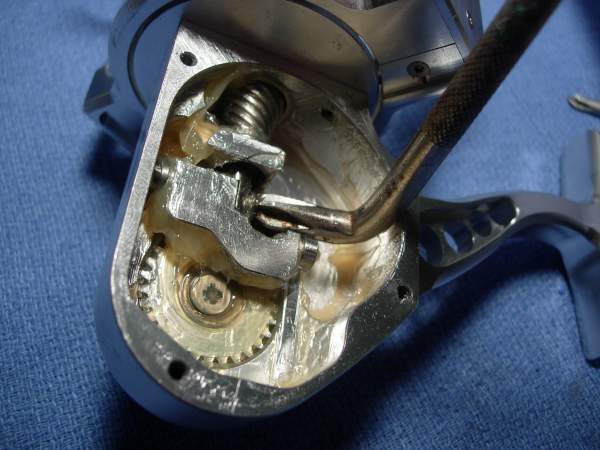 remove the oscillating gear (key #63), flanged bearing (key #64) and bushing (key #65) as a unit. 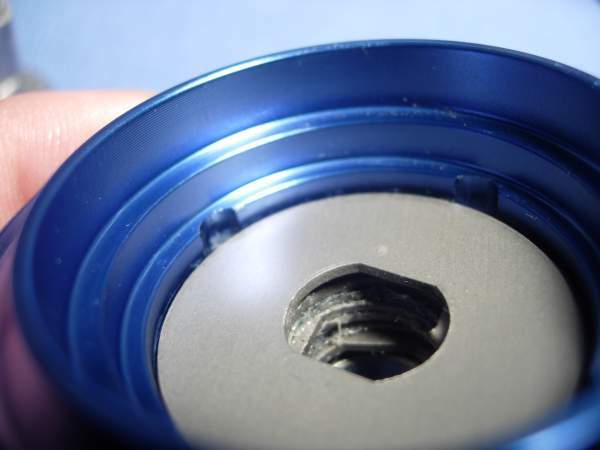 the flanged bearing measures 6x10x3mm. 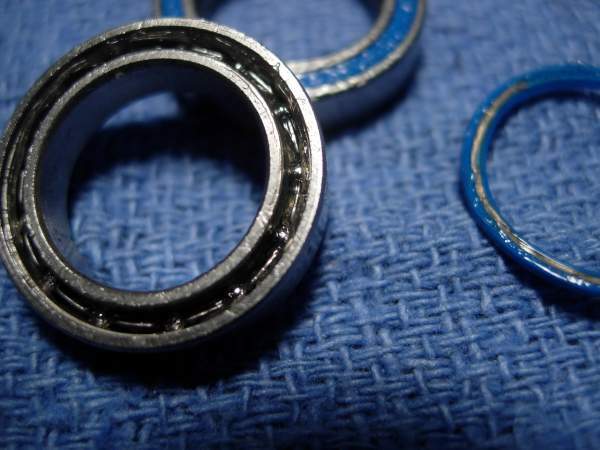 pack the bearing with grease and set it aside. 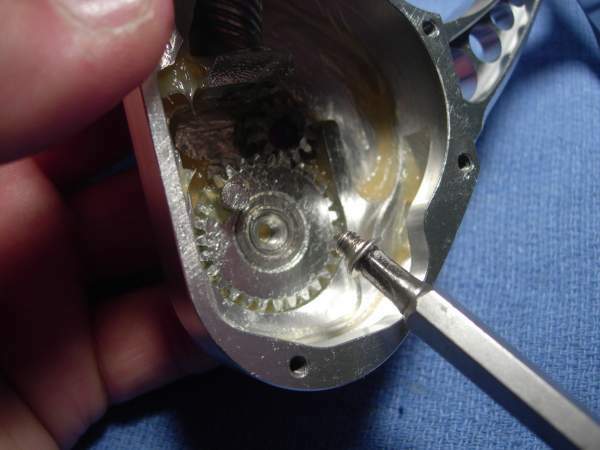 remove the pinion gear (key #69). 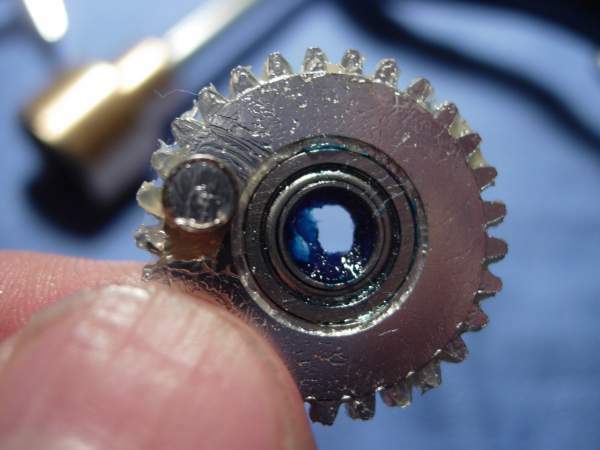 remove the right drive gear axis bearing (key #68) and waterproof washer (key #67). 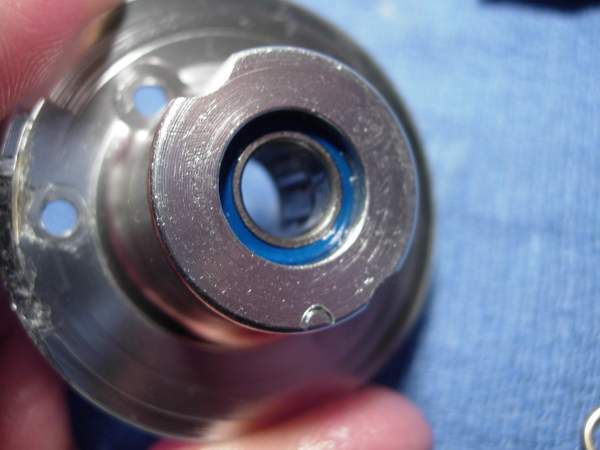 the bearing measures 8x12x3.5mm. let's pack it with grease. 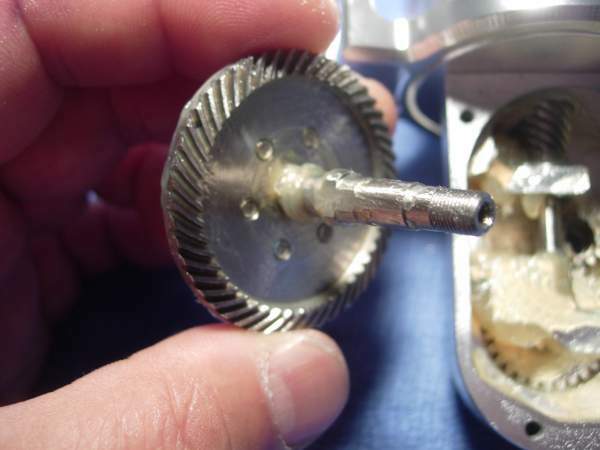 remove the two pinion gear nut screws (key #27). 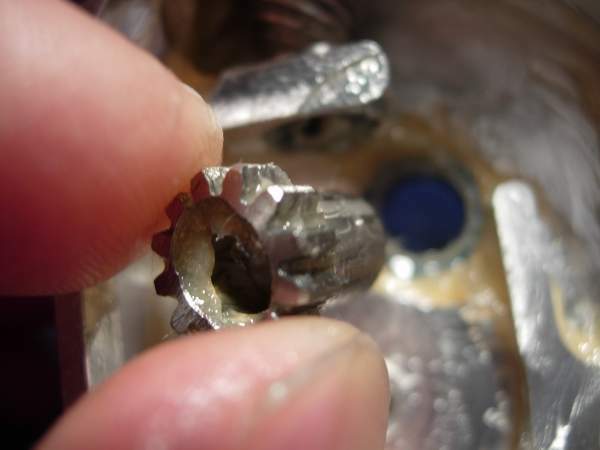 remove the pinion gear nut washer (key #28). 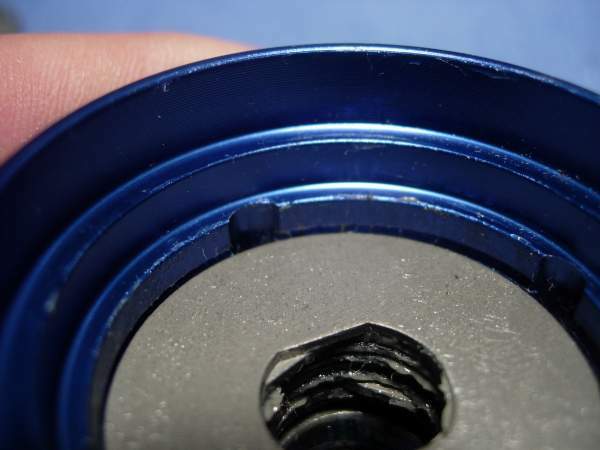 remove the retaining screw (key #35) for the pinion gear nut. 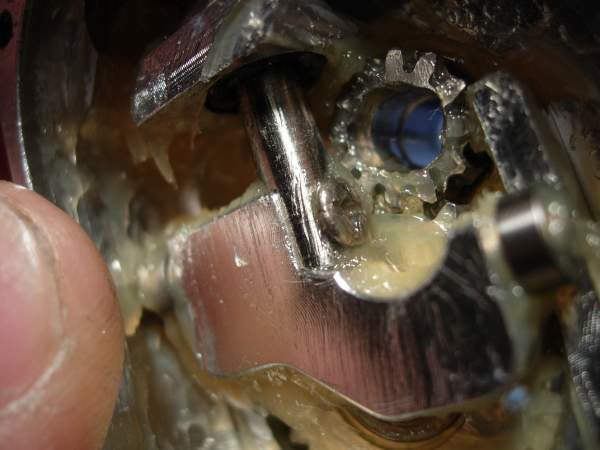 remove the pinion gear nut (key #31), bearing (key #30) and bushing (key #29) as a unit. 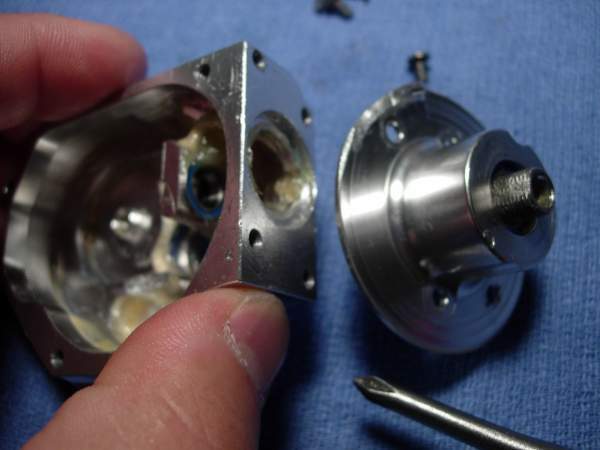 remove the rotor assembly (key #2). 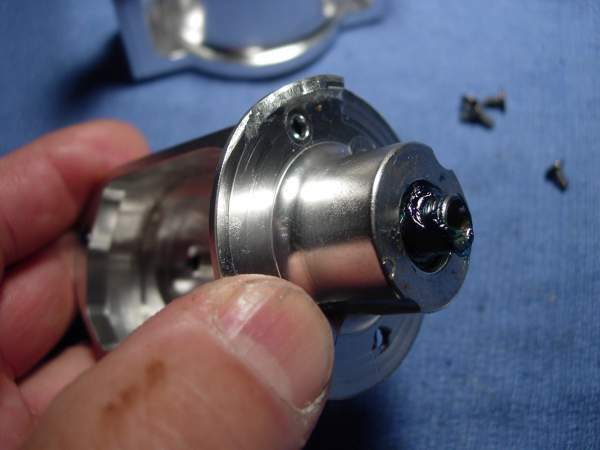 remove the screws (key #49) for the pinion gear bearing axis (key #50). 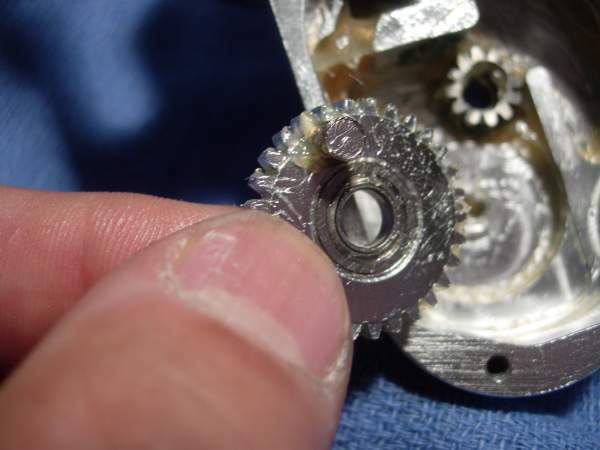 remove the pinion gear bearing axis (key #50) and pinion gear (key #54) as a unit. 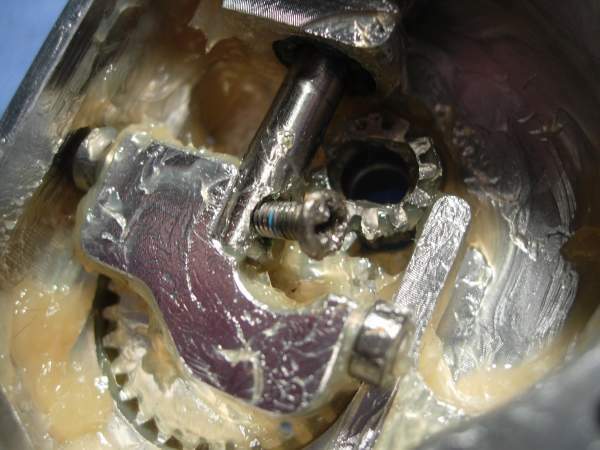 remove the lower pinion gear bearing (key #55) and pack it with grease. 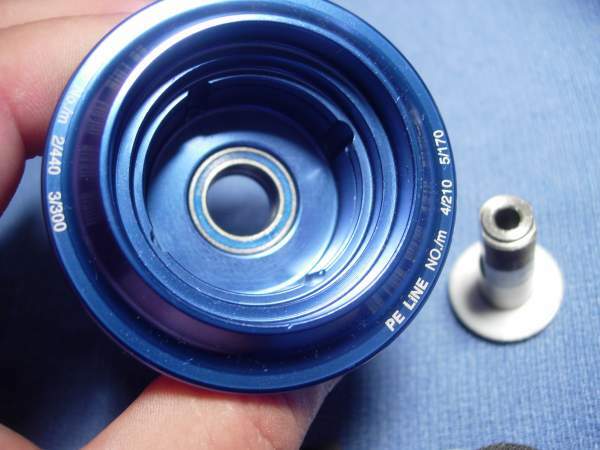 this bearing measures 6x10x3mm. the upper pinion gear bearing measures 8x14x4. it must be removed and packed with grease. 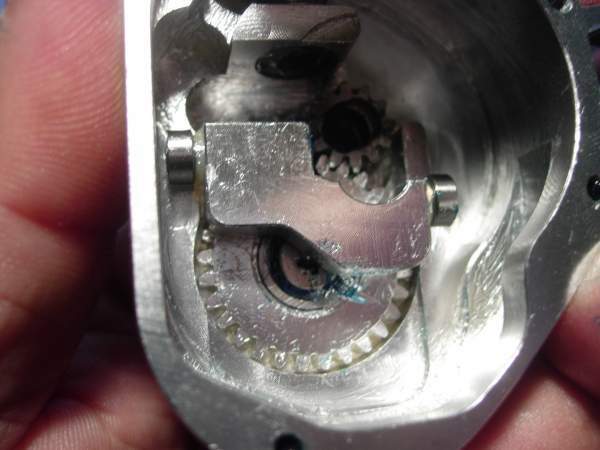 here is the anti-reverse roller bearing (key #53) that sits in the way. the dimensions are 10x16x12. 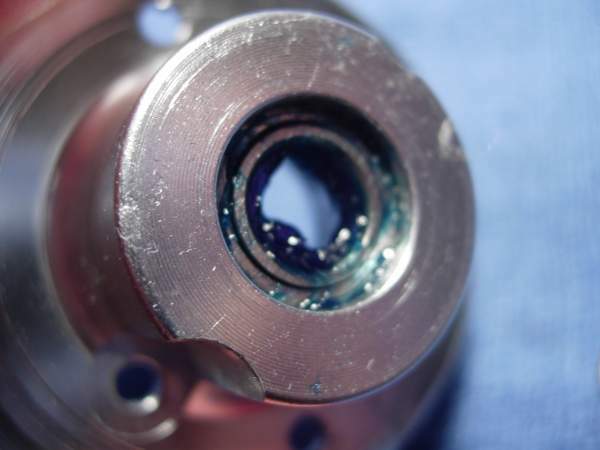 you have to press down on the the ball bearing above to pound out the roller bearing. 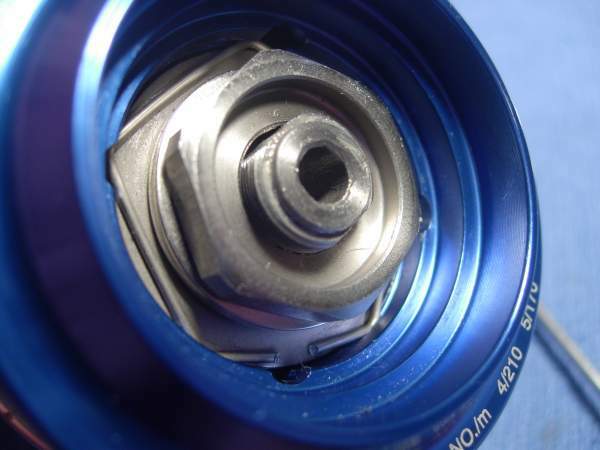 then the ball bearing will fall out. but you are pounding on the inside race of the bearing. 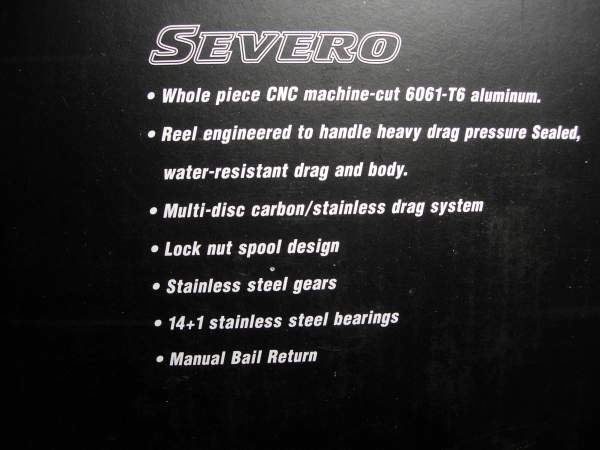 too much and you will damage the bearing. it has to be packed with grease or it will fail. 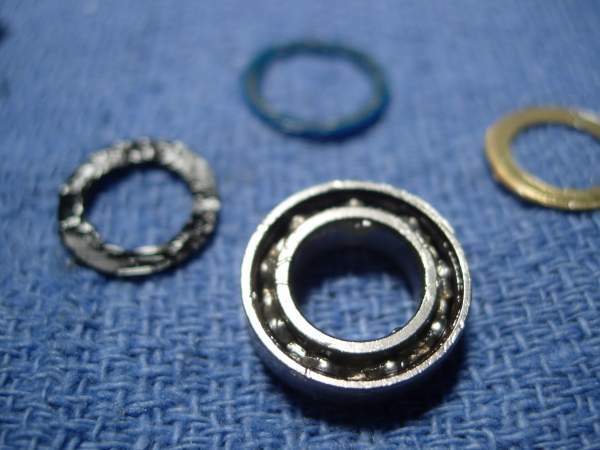 take the opportunity now to remove the bearing and pack it properly with grease, even if it means having to replace it. 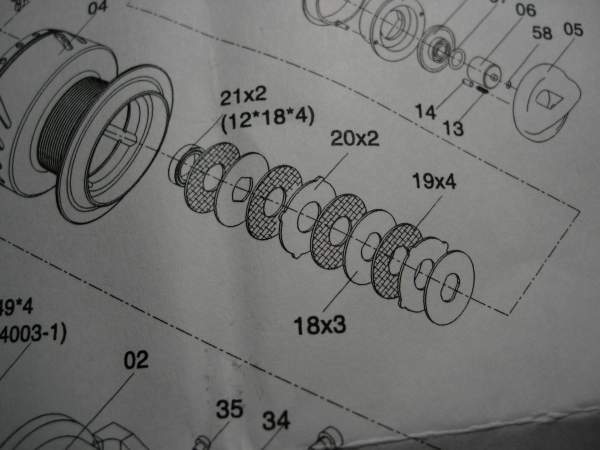 our reel did not come with a thrust washer (key #52). 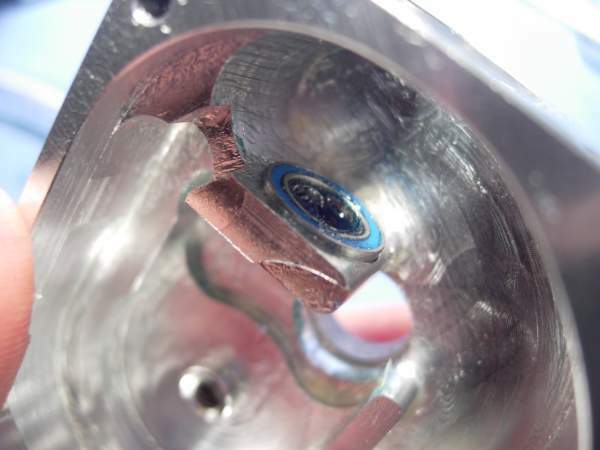 clean up the inside a little, but remember that the fit has to be fairly tight. 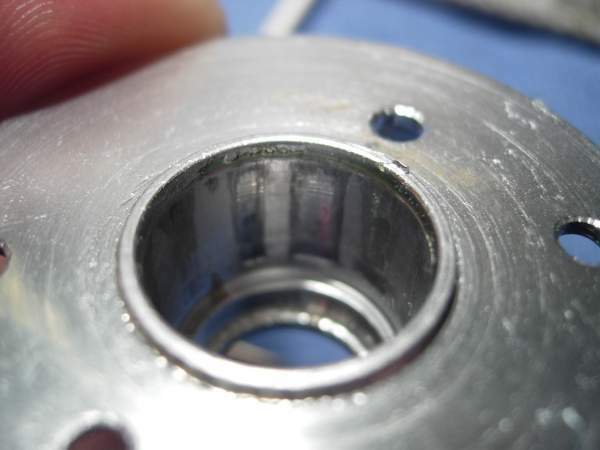 if the anti-reverse roller bearing slips, so will the spool. 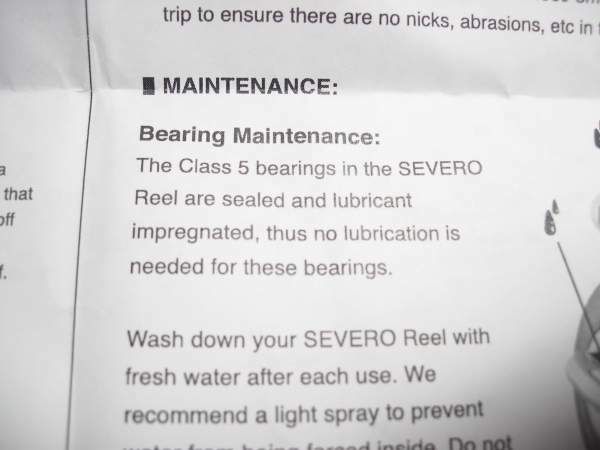 ok, so we totally ruined the original bearing. 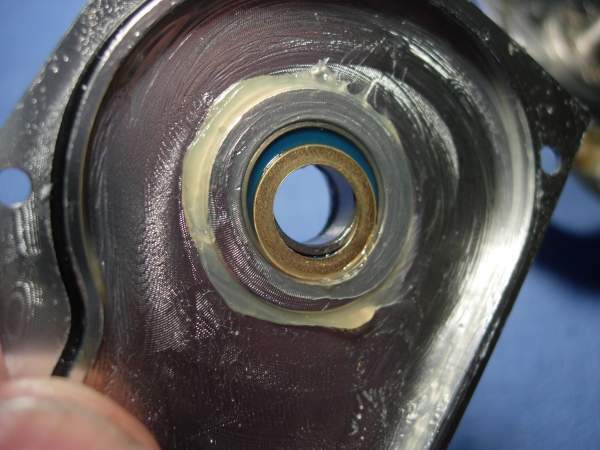 a new bearing was packed with grease and slid into place. 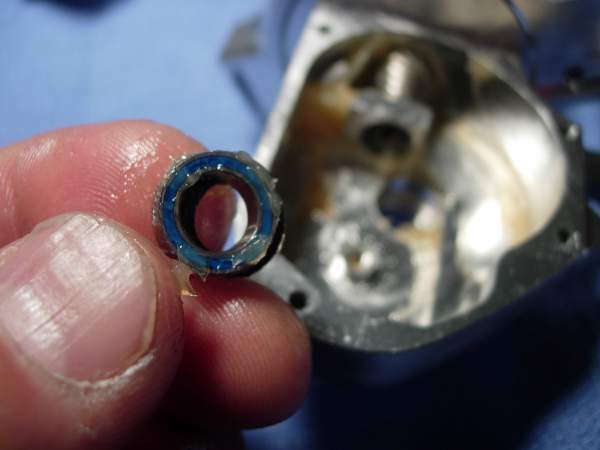 now drizzle a generous amount of corrosion x into the anti-reverse roller bearing. 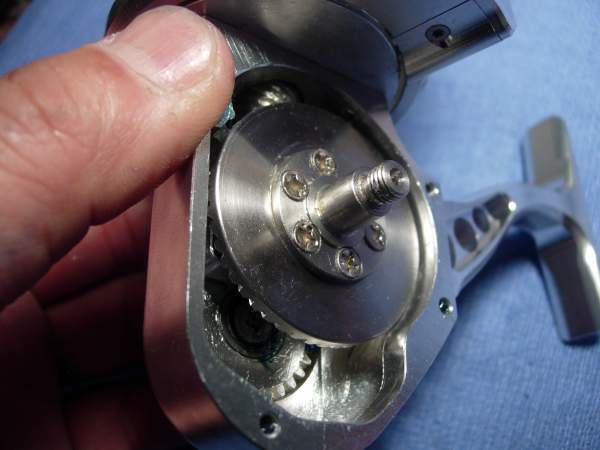 press the anti-reverse roller bearing back into place and make sure you do not get it in backwards. the body (key #1) looks pretty bare right now. 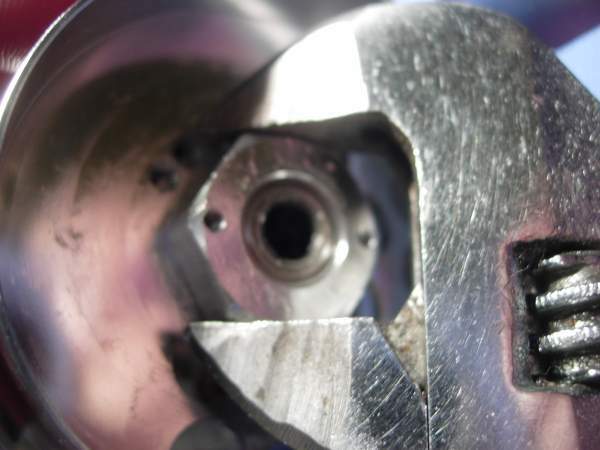 install the pinion bushing (key #88). 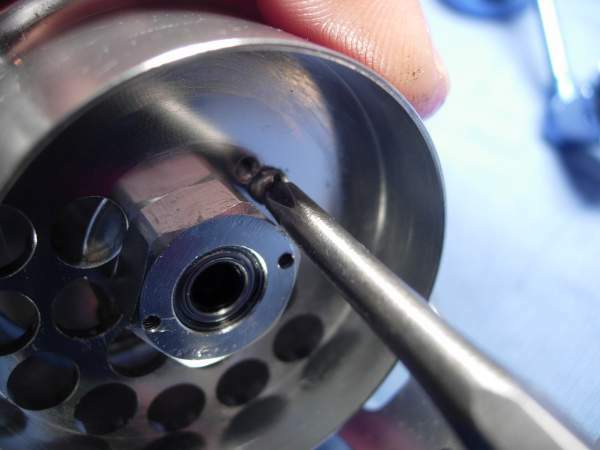 install the lower pinion bearing (key #55). 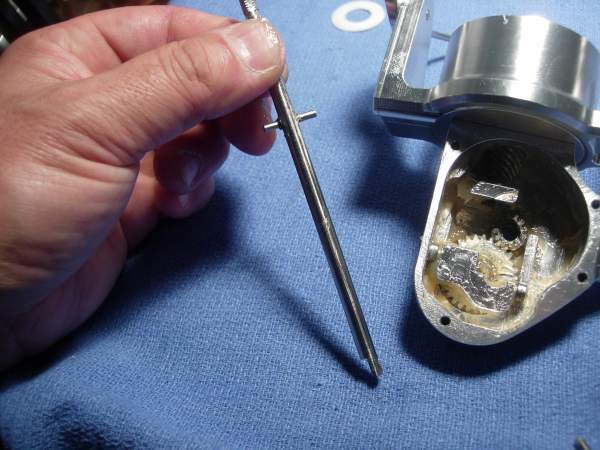 check to make sure this waterproof washer (key #75) is still in place. 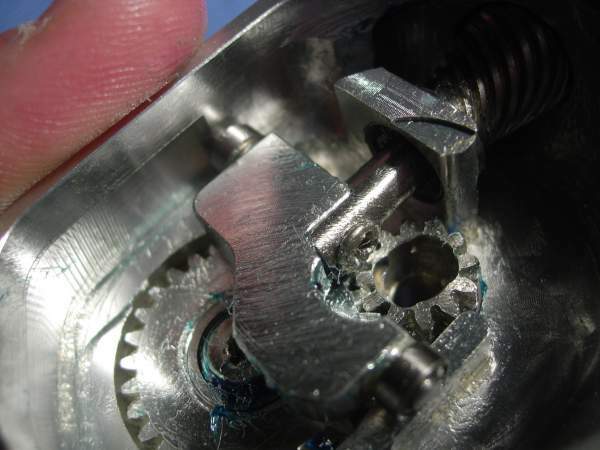 install the pinion gear (key #54). 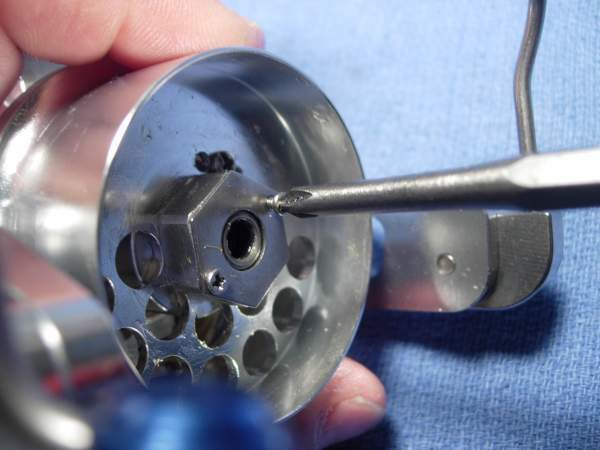 take a moment now to squirt a tiny bead of grease in all the screw holes. 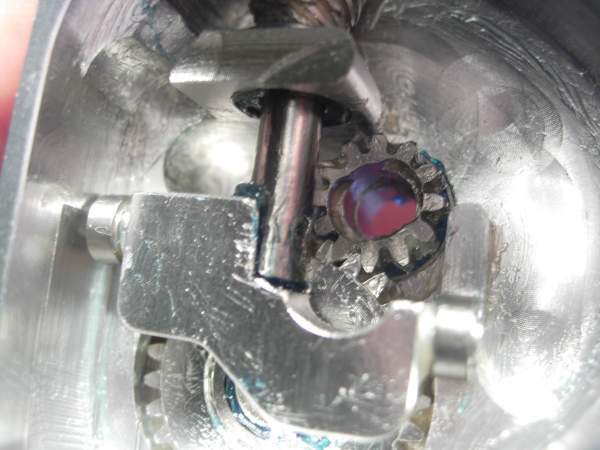 install the pinion gear bearing axis assembly (key #'s 50-53) as a unit. 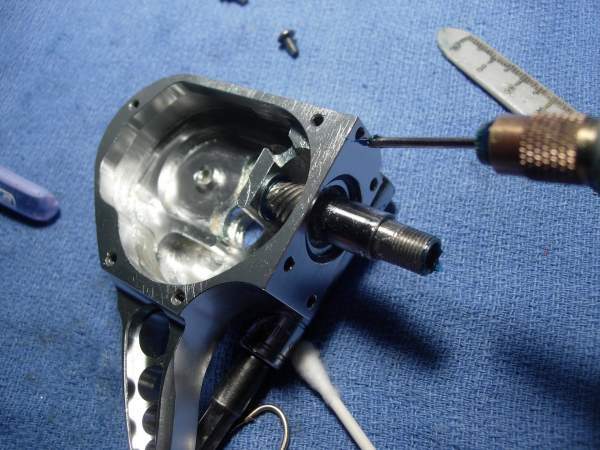 install the rotor (key #2). 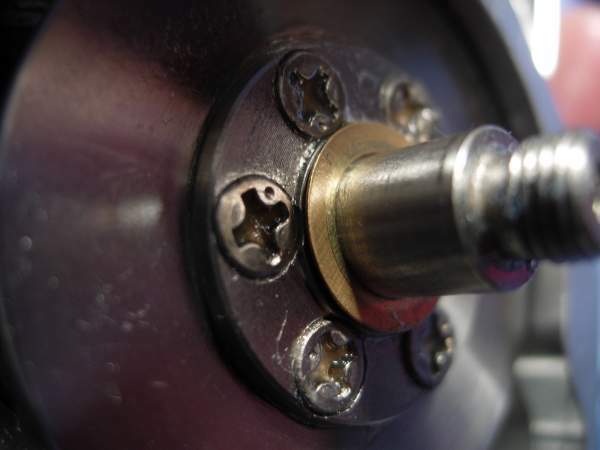 install the pinion gear nut (key #31), bearing (key #30) and bushing (key #29) as a unit. 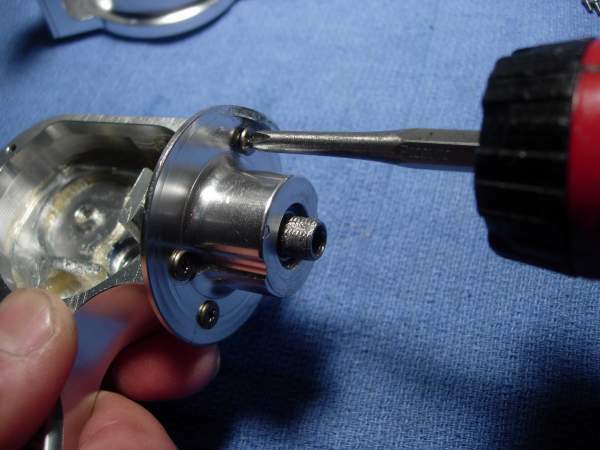 install the set screw (key #35). install the washer (key #28) and screws (key #27). 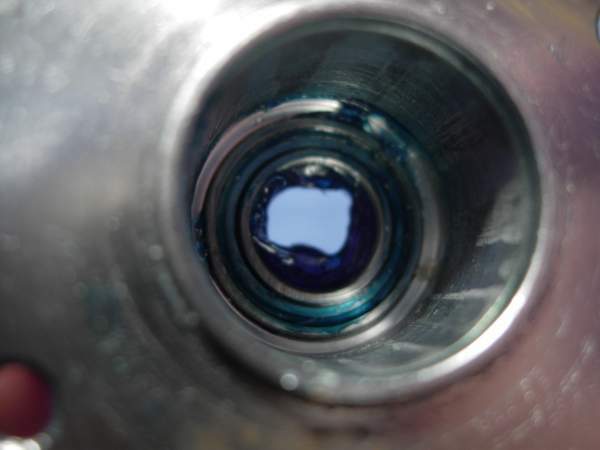 install the right side waterproof washer (key #67). 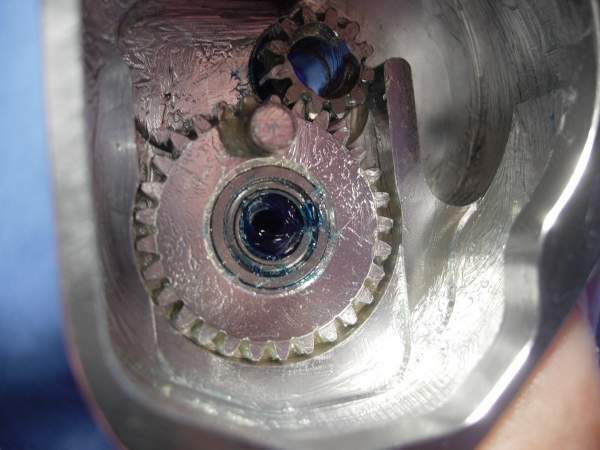 install the right drive gear axis bearing (key #68). 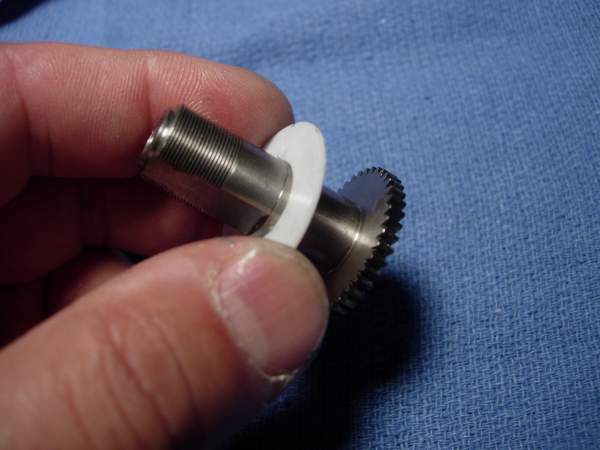 install the pinion gear (key #69) for the drive gear axis. 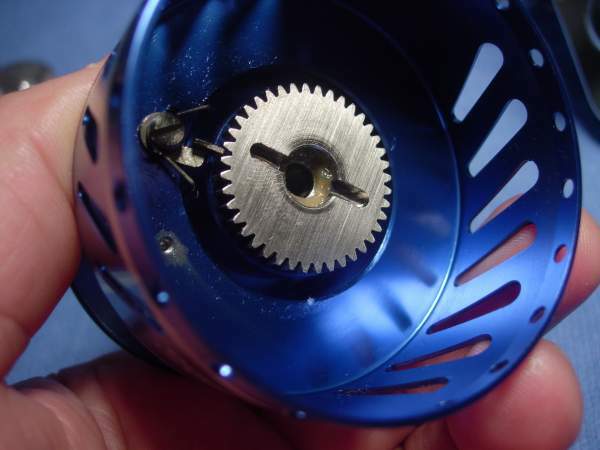 install the oscillating gear (key #63), flanged bearing (key #64), bushing (key #65) and screw (key #66). install the oscillating slider (key #59). 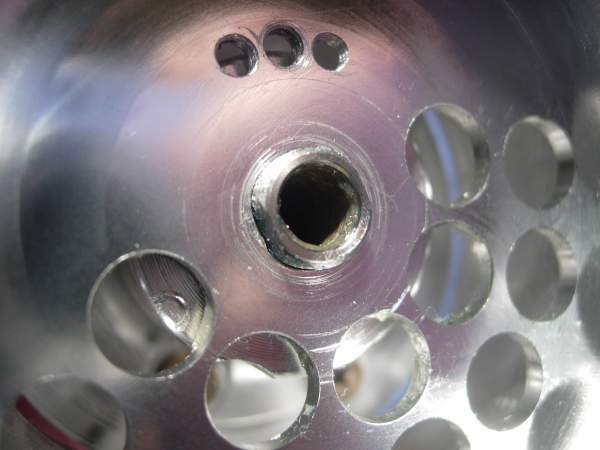 install the main shaft (key #56). 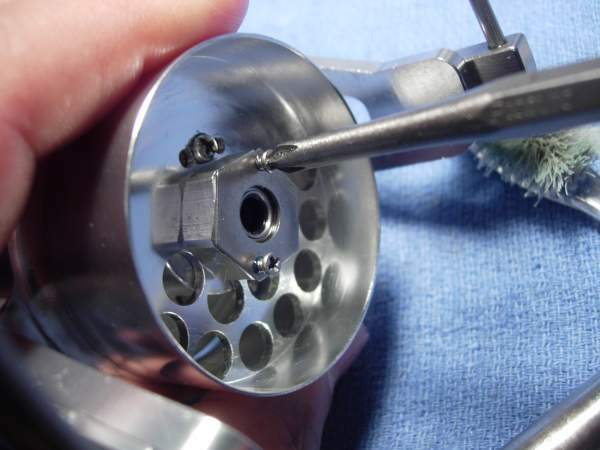 align the main shaft with the oscillating slider. 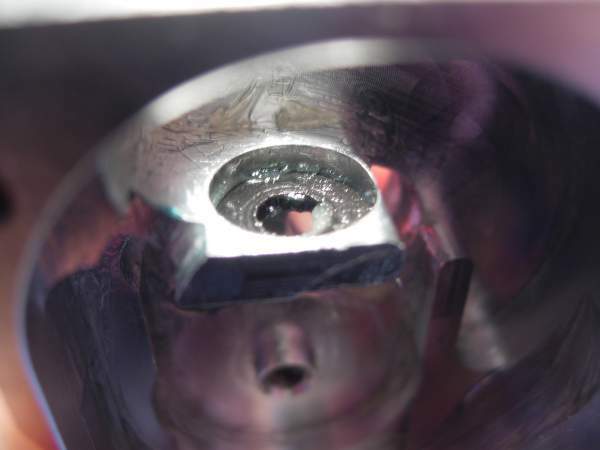 install the screw (key #60) for the main shaft. 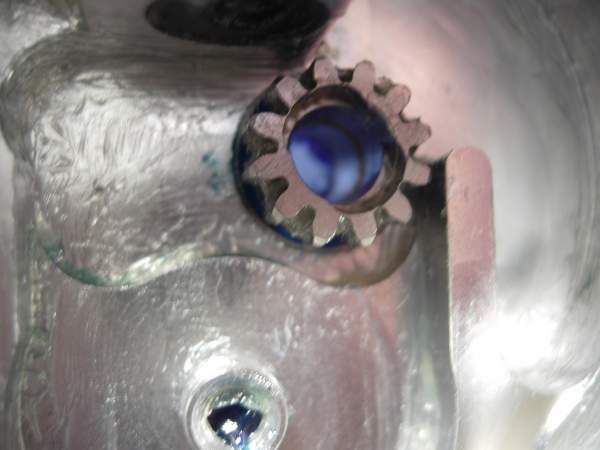 install the drive gear (key #70) and drive gear axis (key #71) as a unit. install the slide cover (key #62). 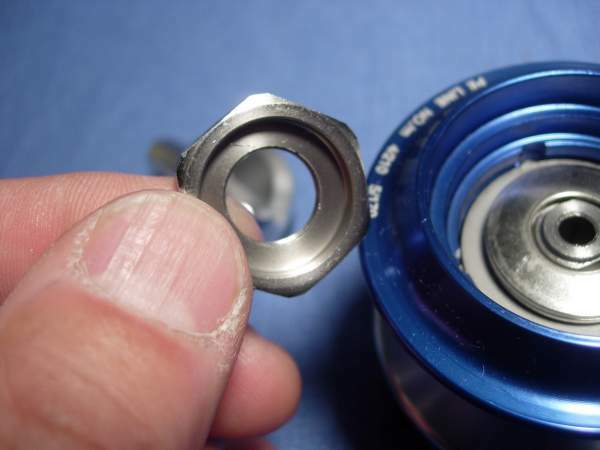 install the washer (key #74) for the right axis bearing. 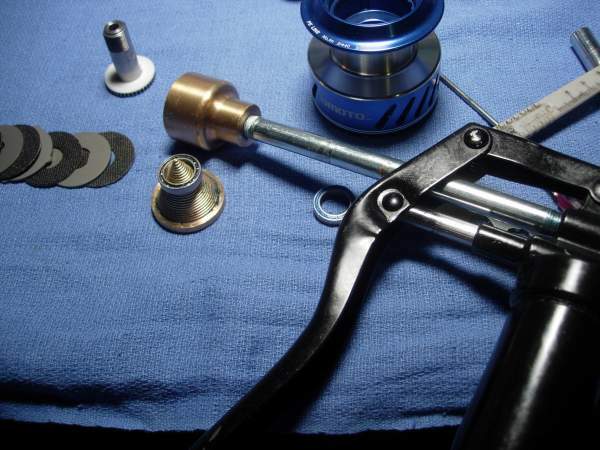 install the body cover (key #3), o-ring (key #76), waterproof washer (key #67) and bearing (key #73) as a unit. 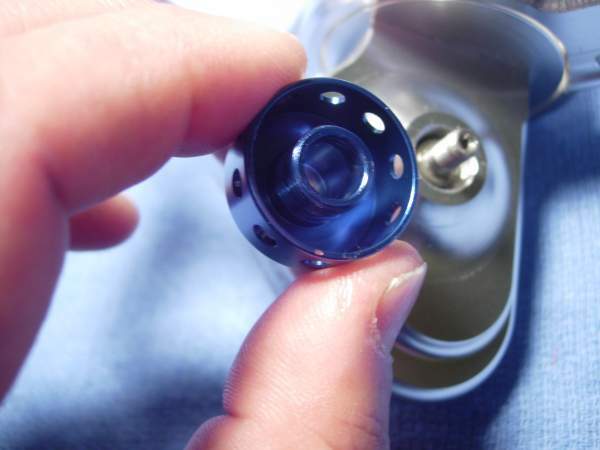 install the body cover screws (key #77). Alan, in respect to the drag washers, the washer at the bottom of the spool is a carbon one. Isn't it the more usual for this to be a metal washer? 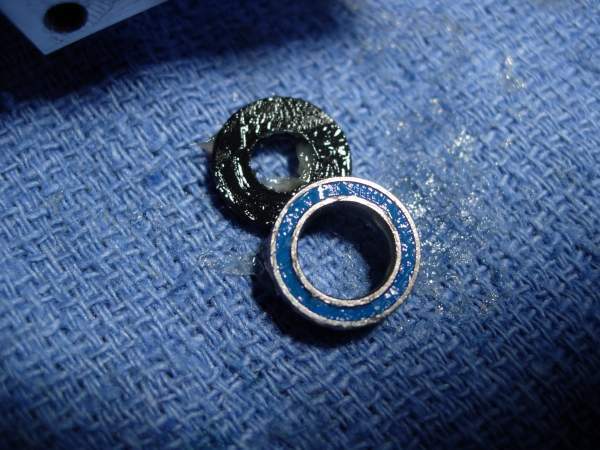 With the bottom one being a carbon one the spool ends with 2 metal washers. 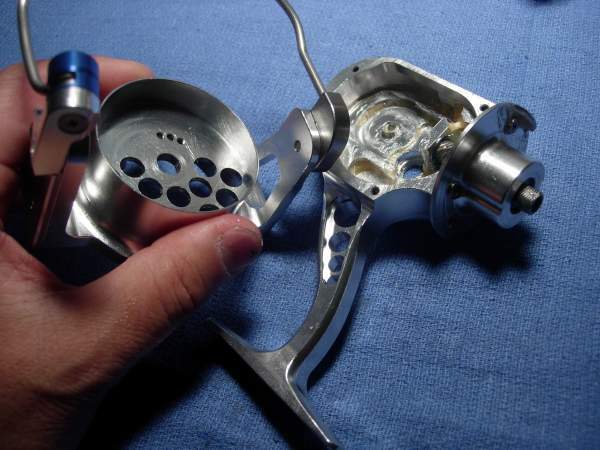 Would the drag improve, including start up, if this metal washer was the first at the bottom? 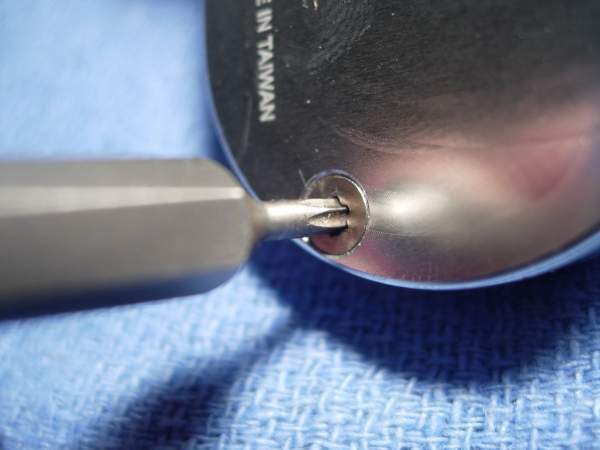 what a monstrosity.the genius that thought up the loctite screw and angled screw driver needed to get it out needs shooting thru the forehead with a ball of his own.this is one for the mentally retarded at omoto. 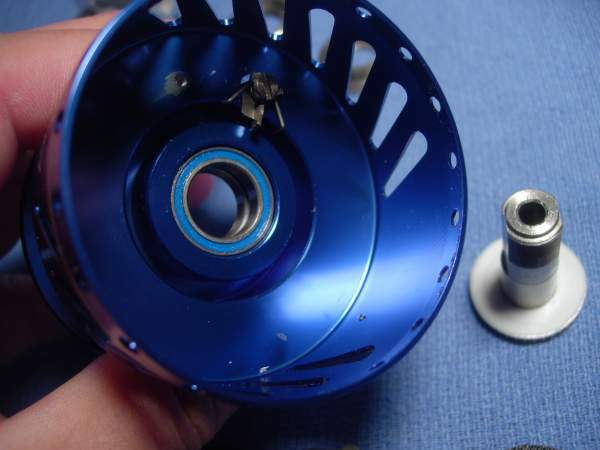 Wallace, I believe that loctite should not be used on a reel...except for a custom handle knob. 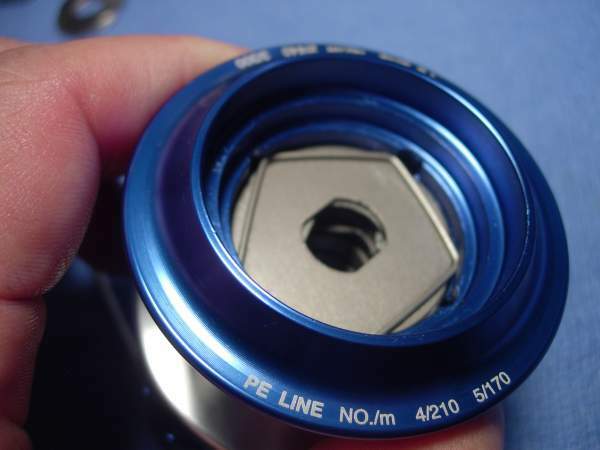 I have a couple of housings for a Penn 9500SS that I can't do much with. Someone went loctite crazy on the screws. No matter what I tried nothing worked. I even applied heat. 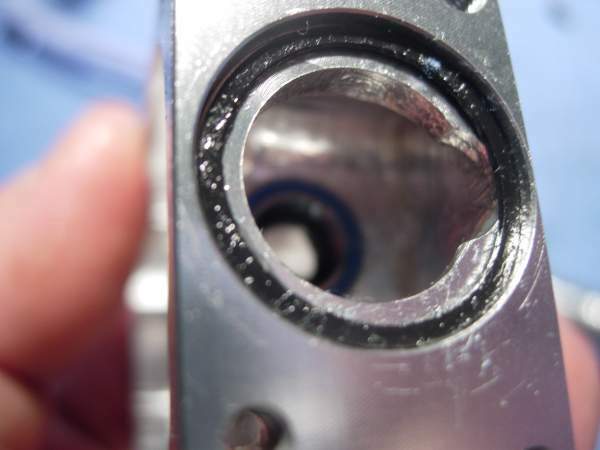 The threads on the housing are pretty much gone. 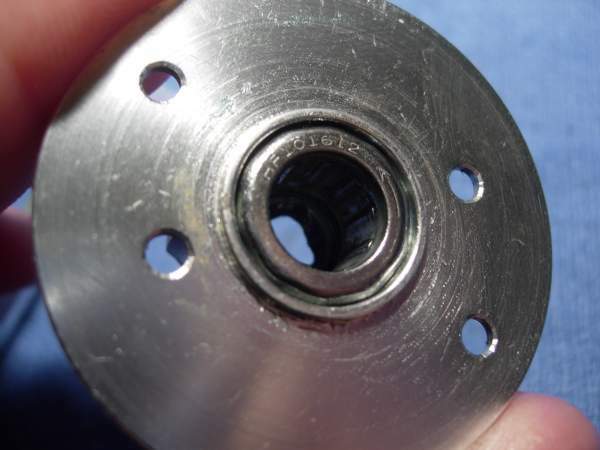 I have been using a stainless steel lock washer to keep the screws, that tend to loosen up, secured. 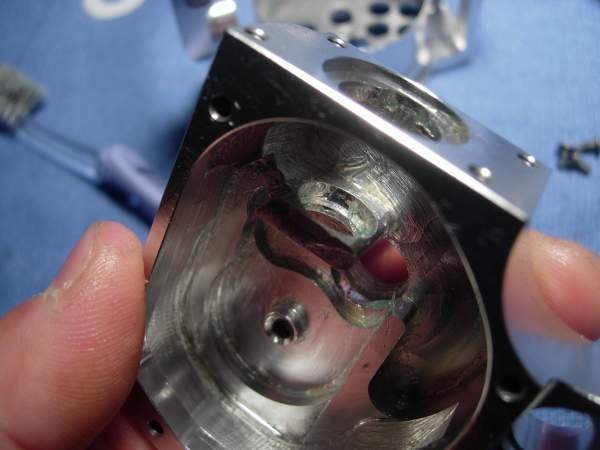 Great tutorial though, and some nice milling on the alloy housing. alan, you tried to insert one more carbon washer but the whole stack was too thick to fit. 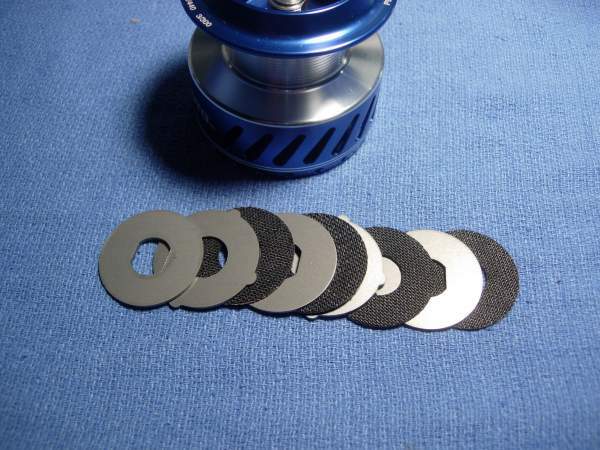 Would a set of thinner carbontex washers fit? crud, i totally forgot about this one. i never did finish it! Do you still have this reel, Alan? I've never saw it at your house. Would love to feel the weight and balance. 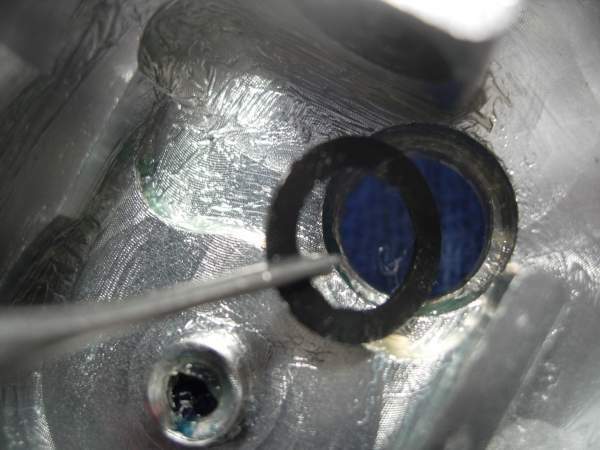 Alan, if you still have the reel how about measuring the carbon drag washers, will like to know the thickness of the one Omoto uses to see if an additional carbontex will fit. it was returned a long time ago, but i'll go through and see if i have any notes. 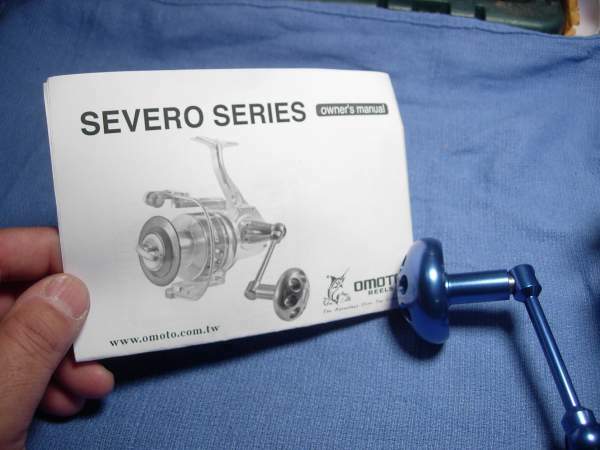 I have a Severo 5000H left. $489.99 shipping include. Any taker??? Call me at 561-568-3980. The following quote is from Alan Hawk when he was reviewing Tica Talisman TG8000. 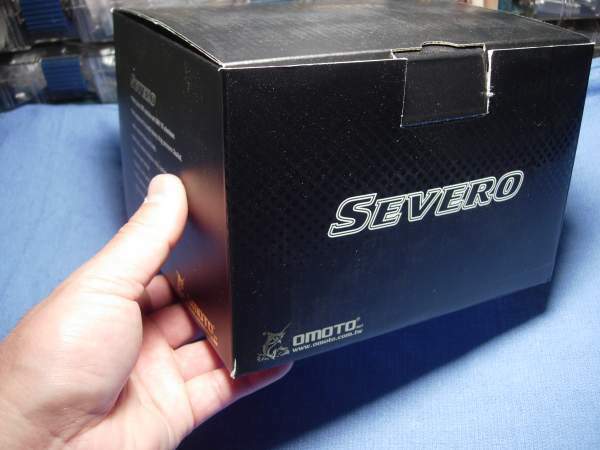 "So far efforts to create a low cost alternatives to those super-spinners failed quite miserably, with the exception of Omoto's Severo which is a very good copy of the Accuarate TwinSpin that works, but Omoto is doing a poor job marketing them leading to their virtual inexistence on the waters of the world." So anyone ever buy and try these out for a while and see how they hold up?